PFF experts use our exclusive player grades and signature stats to analyze the performance of each NFL team and player. The Los Angeles Chargers defeated the Cincinnati Bengals, 26-21, in Week 14 of the 2018 NFL season. PFF’s ReFocused series this season features immediate takeaways and a key to the victory from two Senior Analysts who graded the performance, watching every player on every play of the game. For more data and analysis from the game, utilize our Premium Stats 2.0 dashboard to expand your knowledge on the key players, signature stats and much more. Derwin James made nice plays against the run and the pass. James tackled Gio Bernard for no gain on the Bengals two-point conversion attempt in the second quarter. Desmond King made a nice open field tackle on Joe Mixon to limit him to a one-yard gain on a second down pass. Philip Rivers and company did just enough to edge out the Bengals, giving the Chargers their 10th win of the season. Rivers went 19-of-29 for 220 yards and one touchdown but found Keenan Allen and Mike Williams for a combined eight receptions for 123 yards. A week after Justin Jackson had success on the ground in Melvin Gordon‘s absence, Austin Ekeler was the man carrying the load this week, rushing 15 times for 66 yards and a touchdown. Jackson wasn’t able to continue last week’s impressive performance and was held to 12 yards on seven carries. Jeff Driskel wasn’t exactly trusted to throw the ball down the field as evidenced by the team calling wide receiver screens on third and long or handing the ball off on third and short. In the second quarter, Driskel didn’t appear to be on the same page with his wide receivers, as miscommunications caused the ball to be thrown to nobody twice. Driskel threw a touchdown pass to John Ross on a shallow crossing route in the low red zone with 25 seconds left in the first half. Mixon’s workhorse role continued with Driskel at quarterback, as he was the lead running back and frequently targeted in the passing game on routes out of the backfield. 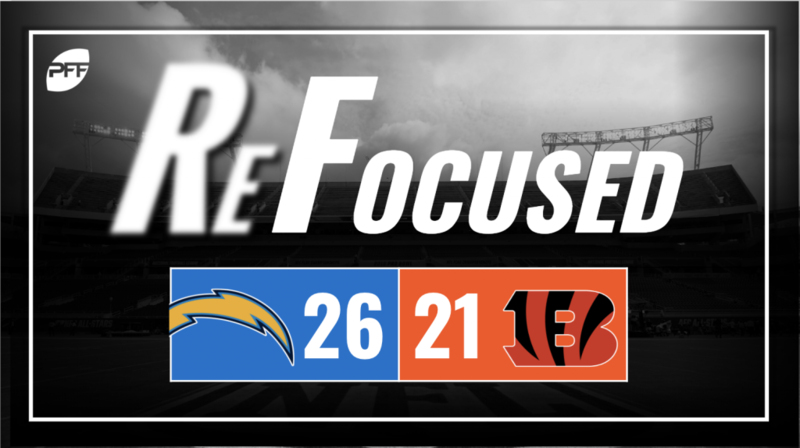 The Bengals’ defense did an admirable job, as they held the potent Chargers offense under 300 yards. The pass- rush sacked Rivers twice and generated pressure a number of times, but the defense was unable to create any turnovers in a game where one could’ve turned the tide. William Jackson III stood out in coverage, as he broke up two passes. Both of those breakups came against wide receiver Allen, who is among the best wide receivers in the league. Rivers and the Chargers will be happy to walk out with their 10th win and keep pace with the Chiefs in what was a mediocre offensive performance. Credit the Bengals’ defense, who held the Chargers under 300 yards. Driskel didn’t make enough plays to get it done against Los Angeles.